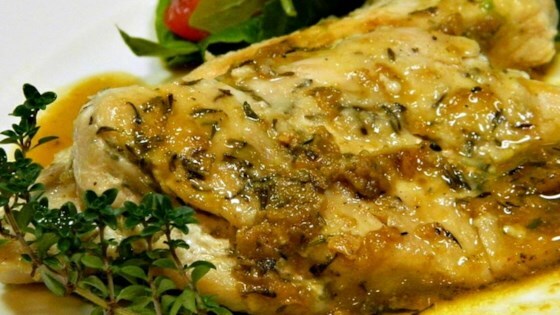 "A simple pan sauce can transform an everyday boneless, skinless chicken breast into a quick and delicious meal. For a finishing touch, garnish with a sprig of thyme." Season both sides of chicken with salt, pepper, and dried thyme. Place flour in a shallow dish and dredge both sides of chicken pieces in flour. Heat oil in pan over medium-high heat. When oil starts to shimmer, add the chicken. (If the chicken browns too quickly, reduce heat.) Cook, turning as needed, until chicken is browned on both sides, is no longer pink in the center, and the juices run clear, 4 or 5 minutes total on each side. An instant-read thermometer inserted into the center should read at least 165 degrees F (74 degrees C). Transfer chicken to a plate and tent with foil. In the same pan, reduce heat to low and add thyme sprigs and cook until aromatic, 1 or 2 minutes. Increase heat to high; pour in Swanson(R) Chicken Stock and wine. Stir up browned bits to deglaze the pan. Add the chicken bouillon granules and mix well. Reduce heat to medium and cook until sauce reduces and is slightly thickened, about 5 minutes. Remove pan from heat. Remove and discard the thyme sprigs. Add to the pan any accumulated juices from the tented chicken plate. Finish the sauce by whisking in the cold butter. Season with salt and pepper to taste. Spoon sauce over chicken before serving. I will make it again, even considering using the,sauce,as a marinade for a future dish. I made this recipe as-is and I feel like it lacked flavor. I think adding fresh lemon juice would make it have more flavor. RAVE reviews from the family. Simply delish! Very easy and very tasty. Something different! !